This chair consists of a profusely carved and pierced arched and shaped back with an outer border depicting scrolling and intertwined vine leaves with a carved band leading onto profusely carved and pierced scrolling vine leaves, oak leaves and acorns. The shaped arms, also carved and pierced terminate with the head of a bear or beast holding grapes in their mouths. The drop-in seat is in excellent condition and has been re-sprung & re-covered in a turquoise fabric (this can easily be changed by the purchaser if necessary). Below the seat is a carved frieze which continues around the chair, below this is a superbly carved and pierced serpentine shaped apron superbly carved with foliate decoration which continues around the chair leading down to scrolling carved foliate front legs. 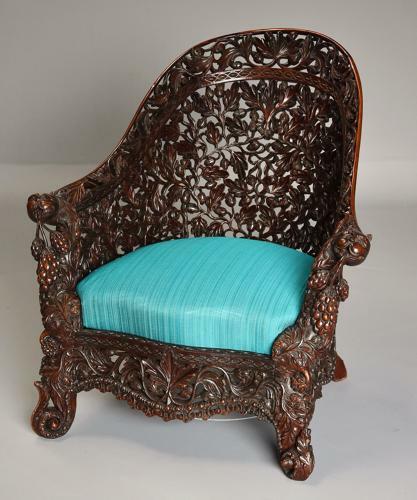 This style of chair and carving is typical to that made in the Bombay area of India in the mid-late 19th century and it was thought that the highly carved furniture was a sign of the owner being affluent. Every possible surface was covered in carving, typically decorated with foliage and flowers and later animals such as birds, lions and beasts. This chair is in excellent condition for age, it is of stable construction and can go straight into a home or collection.